for Artists, Designers, Poets & Philosophers . 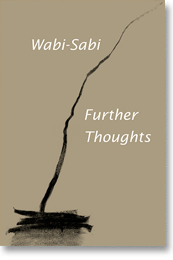 . .
The observations and principles identified in the book as wabi-sabi have probably always been of interest to the aesthetically inclined, but perhaps they had never before been conveyed with such rhetorical intensity, or at such a receptive cultural moment. As a consequence, many people found the book’s vocabulary and conceptual schemes useful in describing aspects of their work. Some even found inspiration for making new things. Over time, other writers and thinkers began incorporating these theories and elucidations into new books about wabi-sabi.